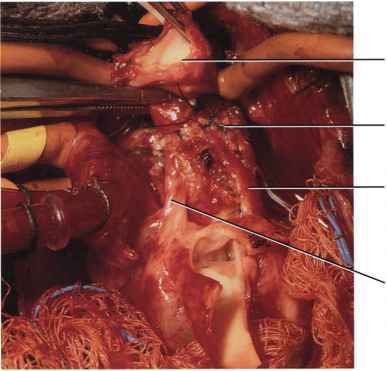 Arterial switch repair is the preferred operation for d-transposition of the great arteries without severe anatomic left ventricular outflow tract narrowing or when such narrowing can be treated with resection. Other surgical repairs are rarely performed. 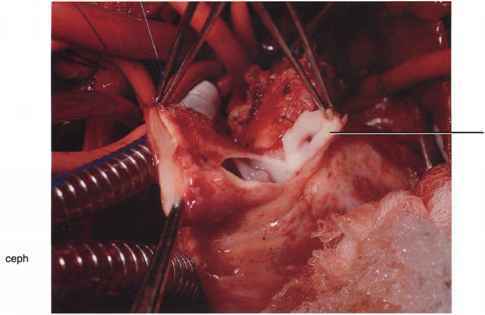 The traditional contraindication to its use is the presence of an abnormal pulmonary valve, which would become the aortic valve after repair, although today one would consider combining a form of the Ross procedure and arterial switch operations for management of such a patient. 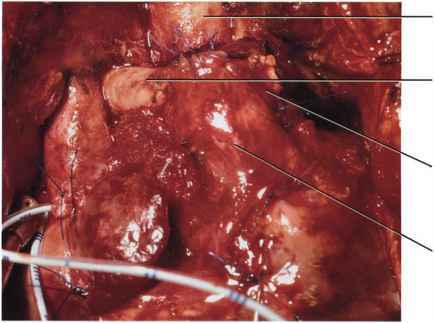 Unusual coronary artery anatomy or intramural course of a coronary are not contraindications. 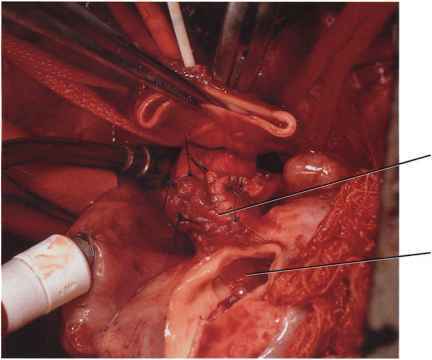 Arterial switch is usually performed in the first week of life because the preparation of the left ventricle may be unpredictable after 10 to 14 days of age. 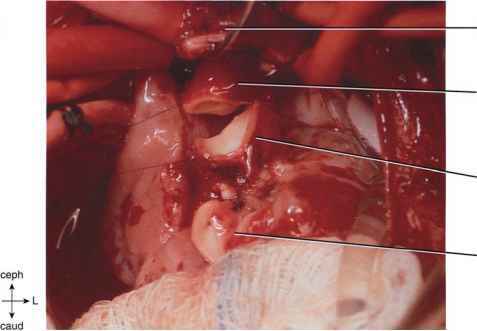 If the operation is delayed, staged repair may be performed with preparatory temporary pulmonary artery banding and Blalock shunt followed by arterial switch after adequate left ventricular hypertrophy has developed. 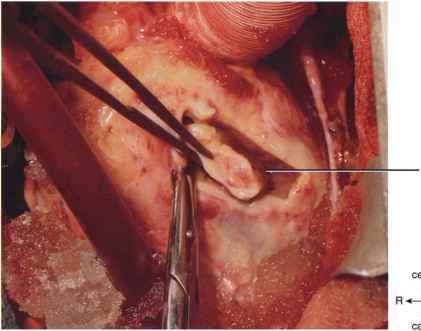 In infants with d-transposition and nonrestrictive ventricular septal defect, total repair may be delayed because the left ventricle remains prepared because of systemic pressure in this chamber. Early repair is still preferable before ventricular function is compromised. Operations are performed using cardiopulmonary bypass with moderate hypothermia, aortic clamping, cardioplegia, and profound local cardiac cooling. 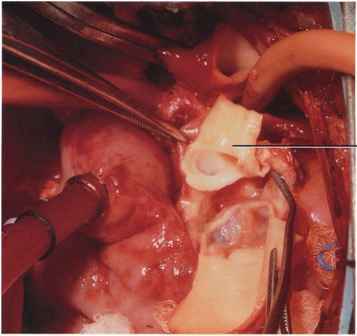 Bicaval cannulation is used and this allows completion of the intracardiac repair during rewarming. Success of the coronary artery transfer is more predictable in the presence of a direct anterior-posterior relationship of the great vessels (0° rotational axis) as compared to side-by-side great vessels (90° rotational axis). The coronary artery anatomy that is most advantageous for successful transfer includes a left coronary artery that arises from the left-sided sinus of Valsalva and a right coronary artery that arises from the right. Figure 15-1. The ascending aorta is anterior and toward the right, while the main pulmonary artery is posterior and toward the left (45° rotational axis). The main left coronary artery arises from the aortic root to the left, and it divides into the left anterior descending and circumflex coronary arteries. Figure 15-2. The right coronary artery arises from the right aspect of the aortic root. Figure 15-3. 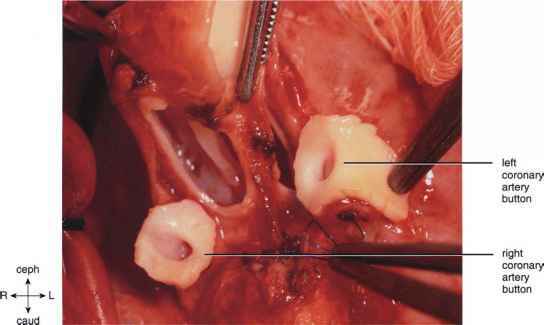 Extensive circumferential dissection of the great vessels is performed and the arch freed as far distal as the isthmus. The left pulmonary artery is dissected circum-ferentially to the left hilum. The right pulmonary artery will be dissected in a similar way. Figure 15-4. 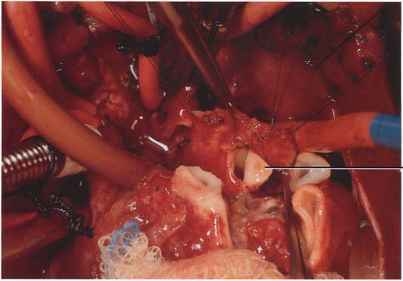 The transverse aortic arch is dissected to the isthmus, and the proximal arch vessels are freed. Marking stitches are placed on the posterior great vessel at the proposed coronary implant sites. These stitches are more accurately placed at this stage of the operation with the vessels distended and the heart beating. Purse string stitches for the aortic cannula are placed laterally in the ascending aorta at the base of the innominate artery. Figure 15-5. The aortic cannula is positioned high and lateral in the ascending aorta. Figure 15-6. 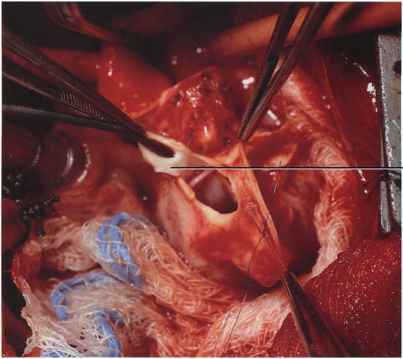 With initiation of cardiopulmonary bypass, the ductus arteriosus is doubly clamped and divided. Figure 15-7. Each end of the ductus is closed with a continuous suture. Figure 15-8. 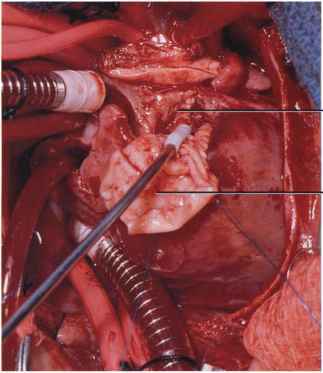 An aortic cross-clamp is applied, and cardioplegia solution is injected. The heart is packed with ice for profound local cooling. 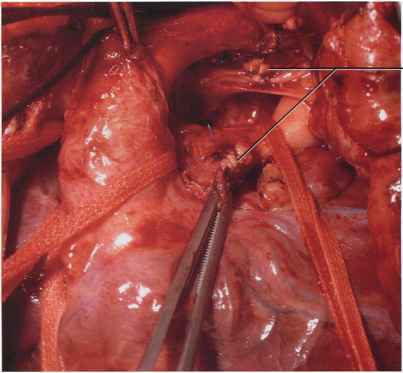 Snares are tightened around the pulmonary artery branches for hemostasis. The aorta is divided, leaving a longer segment near the heart for later use in constructing the neomain pulmonary artery; this may help to avoid branch pulmonary artery stenosis because of less tension on the proximal branches. 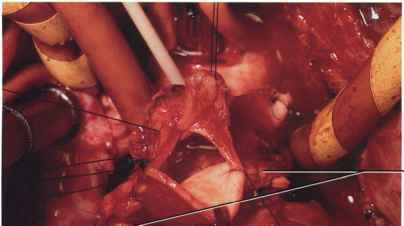 The upper aortic segment can be moved freely because the arch has been extensively dissected. This allows construction of the neoaorta without undue tension on the anastomosis. Figure 15-9. The main pulmonary artery is divided proximal to the branches. 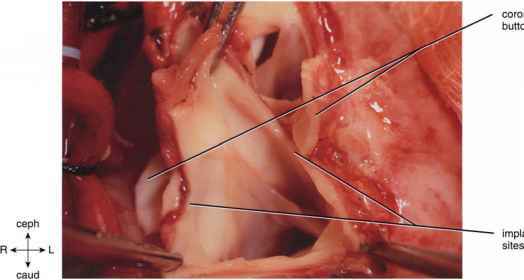 A longer proximal pulmonary artery segment allows ample space for implantation of coronary buttons, while a larger distal pulmonary artery segment facilitates the construction of a neomain pulmonary artery anastomosis without tension. Figure 15-10. A circular button of aorta that surrounds the left coronary artery is explanted. The top of the button is cut as an inverted V to facilitate identification; this helps to avoid twisting the button during implantation. If tissue is available, the button is excised so that its anterior portion is wider; this will help to avoid kinking after implantation. Figure 15-11. The right coronary button is excised with a V at the top, leaving more aortic wall anteriorly, as was done with the left coronary button. Figure 15-12. The two coronary buttons hang free, and the coronary arteries are dissected only a short distance to mobilize them for the transfer to the posterior great vessel. 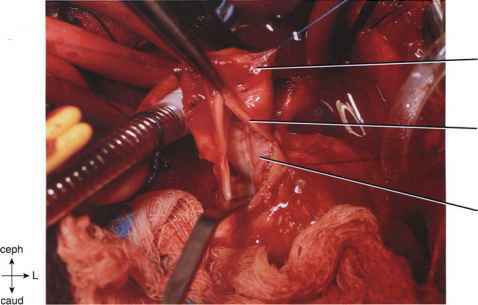 With extensive dissection their support is removed, and there is greater chance of kinking of the coronary arteries after implantation. Figure 15-13. The marking stitch that was placed previously at the site of the proposed left coronary implant site is located. A semicircular or elliptical incision is made in the wall of the posterior great vessel, resulting in a flap that is lifted medially. This flap and the wider anterior segment of the button allow the button to be implanted with less chance of kinking. The elliptical incision is made with care, observing the semilunar valve to avoid injury to valve leaflets. Ideally, the button should be rotated less than 60° degrees in the transverse plane during implantation to avoid kinking of the coronary artery. Figure 15-14. A semicircular or elliptical incision is now made in the anterior wall of the posterior great vessel to accept the right coronary button. 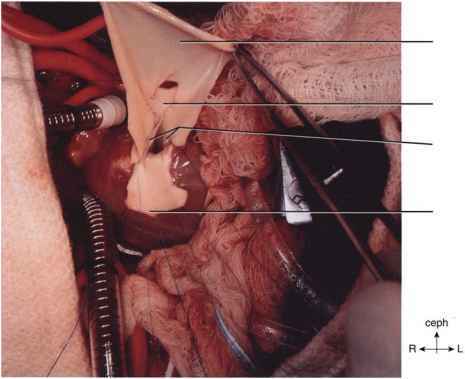 The base of the flap is medial, and this helps to avoid kinking of the coronary artery after the button is shifted posteriorly in the transverse plane for the anastomosis. The wider rim on the anterior surface of the button also helps to avoid kinking. Figure 15-15. The right and left coronary buttons are stitched to respective implant sites with continuous 7/0 monofilament suture. The V at the top of the button is carefully positioned at the top of the implantation site to avoid rotation or twisting of the button on the axis of the coronary artery. 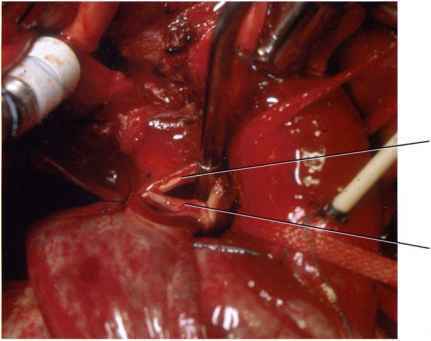 Here, the patency of the right coronary artery is checked by passing a 1-mm probe into the vessel. Figure 15-16. 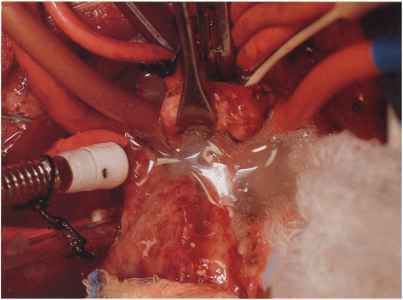 Implantation of both buttons is complete without twisting them or the coronary arteries. The implant sites in the cephalad caudad plane are chosen to result in appropriate tension (not too loose, not too tight) on the coronary arteries to help prevent kinking. The coronary buttons have been shifted less than 60° in the anterior posterior or transverse plane and this also avoids coronary artery kinking. Figure 15-17. 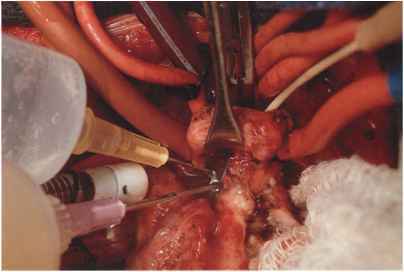 In another patient, an alternative method of coronary button explantation is used. The right button is taken in circular fashion, while the left button is explanted with a larger cephalad segment of aortic wall. The latter is performed by incising the aorta, starting in the transsection rim of the aorta. Figure 15-18. The implant sites in the posterior great vessel are prepared by incising the vessel from its free margin. The coronary buttons are positioned for implantation. Figure 15-19. The left coronary button is implanted with a continuous suture. Figure 15-20. The right coronary button is implanted with a continuous suture. Figure 15-21. In another infant, rectangular coronary buttons are explanted with incisions made from the transsection margin of the divided aorta. Figure 15-22. 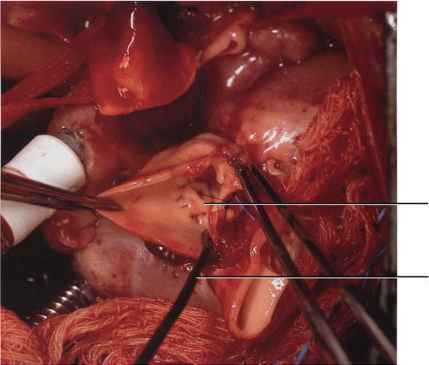 Each button is implanted in the posterior great vessel in respective incisions made from the transsection margin of the vessel. Figure 15-23. 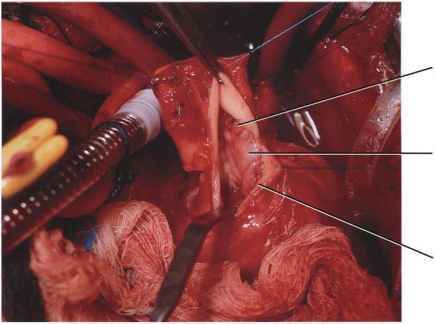 After the coronary buttons are implanted, a Le Compte maneuver is performed by shifting the distal ascending aorta posterior to the bifurcation of the main pulmonary artery. The neoaorta is constructed by end-to-end anastomosis of the upper aorta and the proximal posterior great vessel or neoaorta, which now contains the coronary arteries. Figure 15-24. The posterior neoaorta is constructed with a continuous suture while working within the great vessel. Figure 15-25. 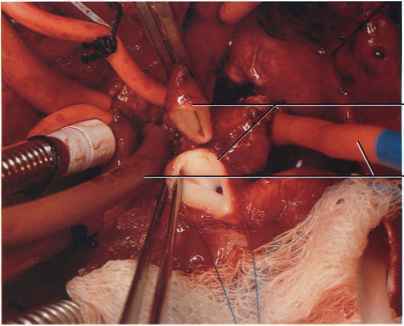 Neoaorta construction is complete after a continuous suture is placed in the anterior part of the anastomosis. Figure 15-26. In another child, the main right and left coronary arteries arise from a single posterior aortic sinus of Valsalva. This is confirmed after dividing the aorta. Figure 15-27. 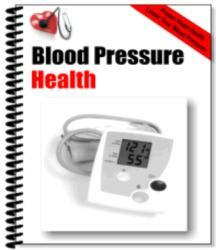 A single button containing both coronary arteries is explanted. Figure 15-28. The button is moved posteriorly and only the upper margin of the button is stitched to the anterior rim of the proximal posterior great vessel or neoaorta. The distal ascending aorta is then moved behind the pulmonary artery bifurcation and anastomosed end-to-end to the posterior great vessel, leaving a large anterior opening to be used in the construction of a tunnel to the coronary arteries. Figure 15-29. A pericardial patch is placed over the remaining opening in the neoaorta and around the coronary button to construct a tunnel for coronary flow. Figure 15-30. In another child, the main right coronary artery and the left anterior descending coronary arise anteriorly from the ascending aorta with orifices near each other in a common sinus of Valsalva. 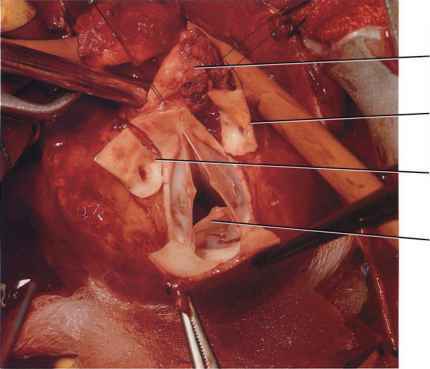 It is not possible to shift these arteries to the posterior great vessel in a traditional way. 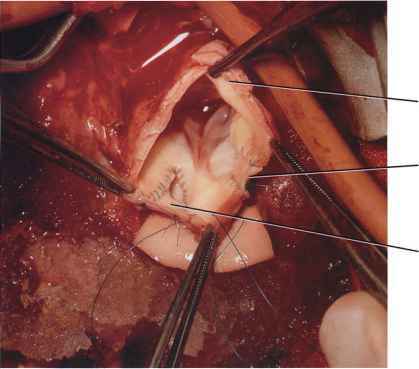 By working through a counter incision in the aorta immediately above the valve, 4-mm adjacent openings are made in the great vessels and are stitched together to create an aorto-pulmonary (A-P) window immediately above the semilunar valves. 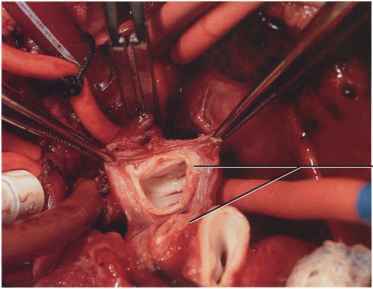 A pericardial patch is placed within the anterior great vessel to construct a tunnel for coronary flow between the aorto-pulmonary window and the anterior coronary orifices. The circumflex coronary arose to the right and was explanted as a single button and then implanted in the right base of the posterior great vessel. Figure 15-31. The aorto-pulmonary window is located beneath the upper end of the pericardial patch tunnel, while the coronary orifices are at the lower end of the tunnel. Figure 15-32. After the neoaorta has been constructed, fibrin glue is injected over the posterior suture line. Figure 15-33. 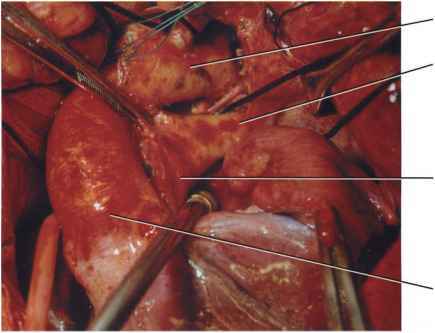 Fibrin glue is also injected around the anterior neoaorta and coronary anastomoses. Figure 15-34. 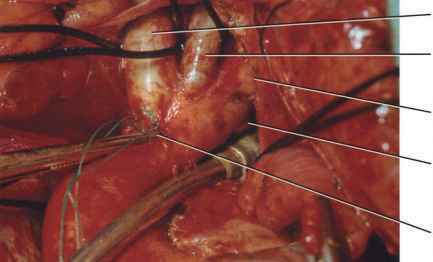 In many cases, the parietal band in right ventricle infundibulum is prominent. 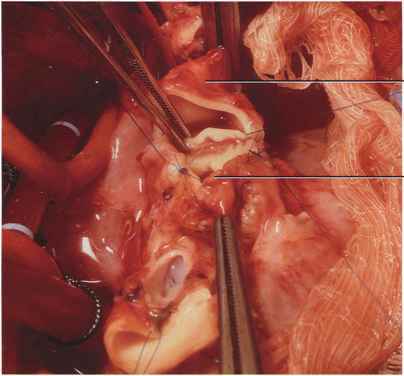 This is routinely resected by working through the valve of the anterior great vessel, thereby avoiding postoperative infundibular muscle obstruction that may alter hemodynamics. Figure 15-35. In preparation for construction of the neomain pulmonary artery, coronary button explant sites will be closed with untreated circular pericardial autografts. 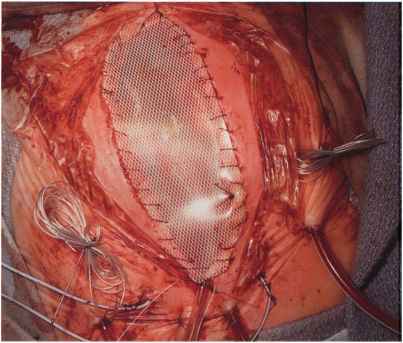 Alternatively, homograft pulmonary artery wall patches may be used. Figure 15-36. 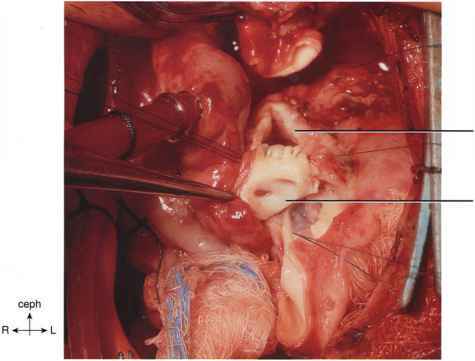 The neomain pulmonary artery is constructed with an end-to-end anastomosis. 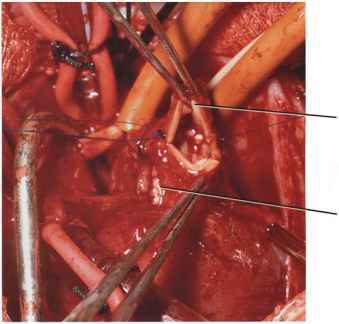 Extensive dissection of the pulmonary artery branches before repair helps to avoid tension on the branches after completion of the repair; this is important in avoiding stenosis of the proximal right and left pulmonary arteries. If there is narrowing of one or both proximal branches, a pericardial patch is placed in the anterior neomain pulmonary artery and across the proximal stenotic branch. Figure 15-37. 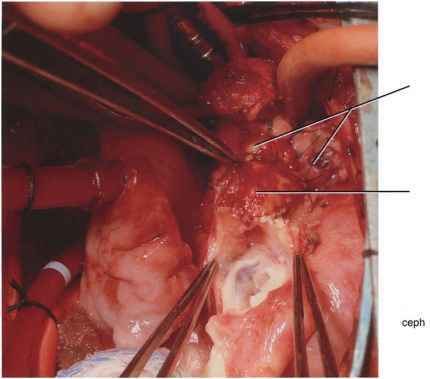 Construction of the neomain pulmonary artery is complete and is accomplished by simple end-to-end anastomosis when the great vessels are in a direct anterior-posterior plane. When the great vessels are obliquely positioned or are side by side, it may be necessary to close the left aspect of the distal main pulmonary artery and implant the proximal anterior great vessel in the rightward aspect of the distal main pulmonary artery and/or the right pulmonary artery. Figure 15-38. When rectangular coronary buttons are explanted from the anterior great vessels or when circular explant sights are large, deficiencies in both posterior sinuses of Valsalva are large. A single pentaloon-shaped patch of homograft pulmonary wall is used to construct the posterior wall of the neo main pulmonary artery. Here, the patch has been stitched into the sinuses and surrounds the previously free hanging posterior commissure. Figure 15-39. The homograft patch has been attached to the neomain pulmonary artery and is retracted anteriorly to show its relationship to the neoaorta. Figure 15-40. 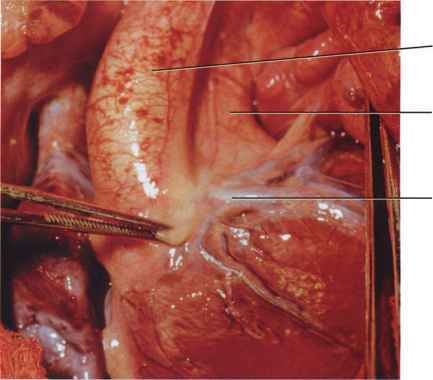 This patch is moved cephalad for anastomosis to the posterior distal main pulmonary artery and branches. The patch will be tailored prior to placing sutures. Figure 15-42. The completed arterial switch repair is seen. There is no tension on the proximal right and left pulmonary arteries. Figure 15-41. 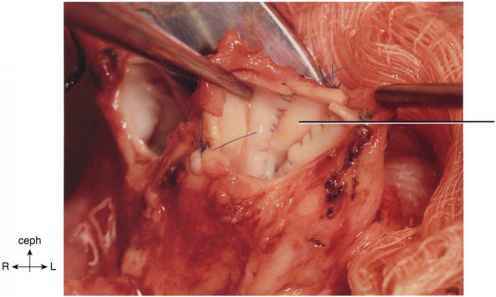 The anterior suture is placed between the proximal native vessel wall and the distal main pulmonary artery. Figure 15-43. In most cases, the sternum is not closed and a large SILASTIC® patch is stitched to the skin as a dressing. More recently, the patch is simply glued to the skin with Dermabond®. This is a useful technique in the presence of mediastinal edema when the closed sternum may press on the cardiac structures and affect hemodynamics. The same benefit may be seen in children who require a high positive end-expiratory lung pressure, which results in undue pressure on cardiac chambers initially following surgery. Delayed sternal closure is usually carried out 1 to 4 days later after appropriate diuresis and/or stabilization of hemodynamics. Figure 15-44. 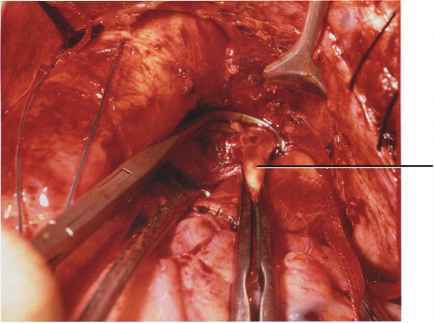 An oval segment of right ventricular wall is removed when the high right ventriculotomy is performed. 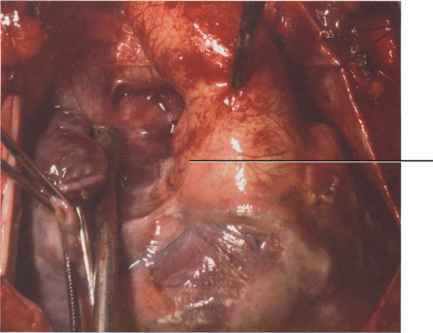 This maneuver is always performed when an extracardiac conduit is attached to the right ventricle because it helps to avoid conduit inflow obstruction. 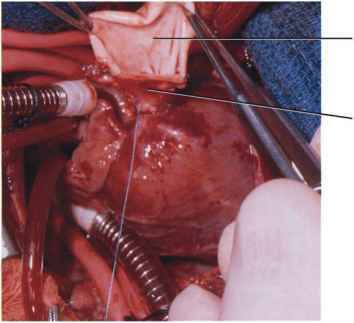 Where are the coronary buttons placed in an arterial switch operation? What is to switch operation in pregnancy?